We'll be drawing ellipses in class this week. They come up so often in still life painting - the tops of pitchers, jars, bowls, plates, cups, vases, flower pots - not to mention when your painting includes bikes or cars or anything with wheels. (There is even a landscape painting method that uses ellipses - remind me, and I'll post information about it later, when we're talking about landscape painting.) It's a good thing to practice. You'll be surprised how spending a little time practicing now, even sketching small ellipses on scratch paper, will serve you well later in your painting. Here is another set of thumbnail sketches from a demonstration in class. Notice how they are simple and loose? Because of the small size, it is easy to play with different compositions. You can try both vertical and horizontal formats, and play with different perspectives and placements. Each one only takes a couple of minutes. This time I chose the first sketch, on the top left. I made a few changes in my composition (you may see the original lines of the table below the current ones). When I turned my composition upside down and stepped back, I realized it needed changes that I hadn't spotted when it was right-side up. I didn't want the edge of the table to touch the bottom of the painting. Notice how the negative spaces are more interesting in the painting than in the original sketch? When you're working with your original composition, see where the light and shadow are falling. Light and dark can become interesting elements in your composition. Do not worry about details at this point! You are blocking in the big shapes of your composition; this stage of the painting is all about establishing your composition. Thumbnail sketches give you a great way to work out different compositional ideas, quickly and in miniature. They allow you to spot compositional weaknesses, and work out patterns of light and dark, all before you ever begin the painting in earnest. 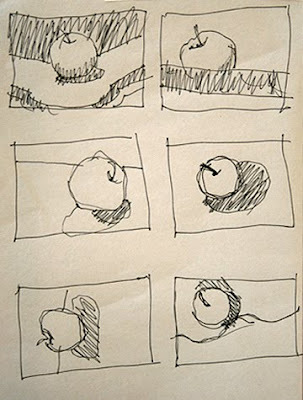 Here are three thumbnail sketches of a pear I drew as part of a class demonstration in the last couple of weeks. (Please pardon the images showing through from the handout on the reverse.... See? You don't even have to use nice paper for these. They're quick and easy.) Looking at the three, I decided I preferred the composition on the top right. I worked out the lights and darks. Then I was ready to turn to my painting. When you begin your painting, remember that you can't get to the end when you're only just beginning. Often students are tempted to focus on some lovely detail in some small part of the painting - like the lighting and surface details on that juicy pear - instead of working all over the whole surface. It's going to look sketchy at first - that's okay! That is actually a very good thing! The important thing is to get your composition worked out and make sure you like it. Turn it upside down. Is it balanced? Are the negative spaces interesting? Then, after you've made any changes to the initial composition, block in big shapes of color. Don't leave white spaces! (I know this is hard for watercolorists.) If you leave a space white, that white will assume more and more importance as the painting progresses - and you will become more and more nervous about what to do there. Be kind to yourself - you can avoid a whole lot of stress by just putting color there. Don't worry. You'll change it later anyhow. Trust me. Classes have moved to the Calistoga Art Center's new space, in the historic Masonic Building on Lincoln Avenue (Calistoga's only building with three stories and an elevator). It's a lovely, light-filled space on the second floor. We may now have enough elbow room for everyone - and enough room for easels, too! Every painting begins by blocking in the composition. There may be as many variations of how to do this as there are painters, but we still share the basics. In class, we talked about drawing in the lines of the composition, either with paint, or water-soluble fabric pencils or fabric markers (whose lines will dissolve when we come along with water and acrylic paint). Then you begin blocking in the big shapes of your painting. It's all very rough at this stage - you don't want to even think about the details yet. Painter Jerry Fresia, originally from San Francisco but now living in Lake Como, Italy, has posted a great example of how to block in a painting in "A Painting Class on Lake Como, Italy." While he is painting in oils rather than acrylics, and begins drawing his composition with charcoal initially (vine charcoal is often used by oil painters for this), his process is basically the same one I demonstrate in class. Notice how he also chooses to scumble in his colors initially (not as necessary for acrylic painters as oil painters) and how he works from darks to lights. He breaks down his painting process into different stages of development that are helpful to see. And while you're watching, enjoy the views of Lake Como and the beautiful castle he lives in! In class, I've been talking about and demonstrating the usefulness of thumbnail sketches. They allow you to quickly work out different compositions before diving in to your painting. Often the first, most obvious ideas may not be the most interesting compositions - and drawing a series of thumbnail sketches allows you to make that discovery before you even begin your painting. "Thumbnail Sketches," a video posted by AnnelieArt, is a 48-second example of playing around with lines and moving different compositional elements, just to see what you come up with. "How to make a thumbnail sketch for an oil painting" is a minute-and-a-half long demo from Expertvillage of creating a values sketch (values refers to light and dark). Both are quick, good reminders of the possibilities thumbnail sketches allow us to see. Twice a week, British Columbia painter Robert Genn sends me a thoughtful, thought-provoking letter. I'm not the only one who gets to read these gems. I've probably been subscribing since 2000 or 2001; since that time, his list of subscribers has grown by hundreds of thousands. He writes about what's on his mind, artistically speaking; shares his experiences painting all around the world; talks about the creative process; and responds to the questions of correspondents. I always learn something new. You can read about the newsletter and subscribe at www.painterskeys.com. If you'd like to read a sample of previous letters, posted with the responses of his subscribers, you can pick from a selection of current ones at http://clicks.robertgenn.com/. 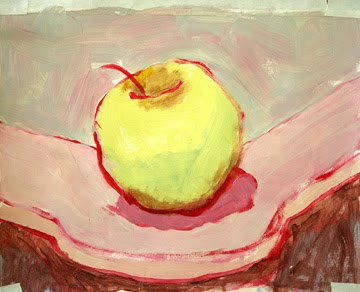 If you'd like to see his work - primarily, but not exclusively, landscapes - you can find it at www.robertgenn.com.